I must admit, I was very intrigued for this book ever since I saw it in the advance solicits. Something about that cover and the blurb on the book made me want to find out more. So after pre-ordering it, I sought out a black and white, small book of the Green Monk, which was a very cool, one panel a page book about a monk that fights with a blade of grass. As cool as the small book was, this book, this book is amazing. Even though I would encourage you to grab the smaller book of Green Monk, it is absolutely not needed for this new iteration. The smaller book laid the groundwork for many of the ideas here, but this is the full master plan, fleshed out in color and ready to amaze. By Brandon Dayton, the book begins as any good origin book should: at the beginning, and in this case, as the beginning of the life of our protagonist, the Green Monk. Left at a monastery as his mother passed on after delivering her son to the monks, young Alexey was baptized and raised at the monastery, with dreams of slaying evil and actions of helping those in need. Alexey is eventually faced with a choice by beings not of this world: choose your weapon. He chooses a blade of grass, which becomes a green sword when he awakens in the real world. Good timing, as his home is being raided at that very moment. It is with this sword he avenges and protects his brothers, but in doing so, breaks his vow as a monk to never harm another. This forces the brotherhood to exile the Green Monk to atone for his sins, to save one life for every life he took while saving his brothers. Then, and only then, can he return home. Dayton has created a world of wonder and sorrow, and a character we can all relate to. When forced into an impossible situation, you make your choice, you choose your actions, but you must also pay the price for them. The story is well told and the artwork is stunning. 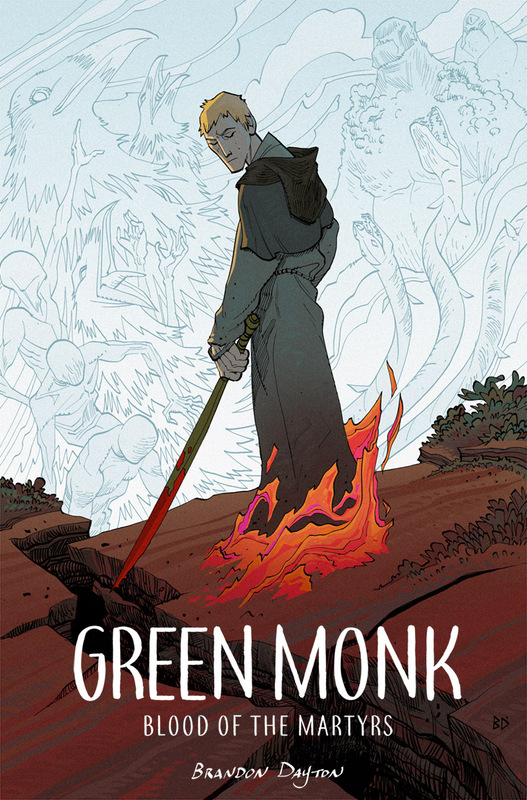 I absolutely loved Green Monk: steeped in religion, mythology, and history, this book is going to go far. I cannot wait for the announcement of a second volume.